Beautifully furnished cottage offers a sweet and peaceful getaway for those who need some R & R. Situated on owner's park-like estate, there are numerous trails and community areas for sitting back and breathing in the beauty of nature and listening to the babble of nearby Indian Creek. This lovely cottage melts away stress upon entry with comfortable sitting areas, gas stove, fireplace with porcelain heater, cute kitchen for preparing meals, and lovely dining space. A private master bedroom space downstairs features a comfy queen bed and TV/DVD player. The 2nd and 3rd bedrooms are located upstairs, one has a single double bed and TV/Blue Ray DVD player and the other larger room has 3 double beds and TV/Blu Ray DVD player. The owner even provides a popup tent and two sleeping bags if the kids want to bunk outside. The back deck has table and chairs with propane BBQ, large yard for playing and the perfect spot for roasting marshmallows around the campfire. Explore the creek and many trails to experience the sights, smells and feel of the Olympic Peninsula without ever having to leave the property. 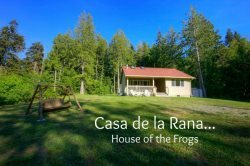 Located just 8 miles west of the town of Port Angeles for groceries, movies, shopping, and wonderful local restaurants and only 10 miles from Lake Crescent for hiking, biking, swimming, kayaking and boating adventures. Sol Duc Hot Springs and the Hoh Rain Forest, and many waterfall trails are just beyond for day trip adventures. This is a non-smoking, family friendly property. The neighboring "Elwha Place" and "Indian Valley Retreat" can be rented together with the Cottage for larger family gatherings. ***Please note that the nightly rates for this property are based on 4 guests; each additional guest is $15/night up to 8-9 guests max. Home is Available the months of April through September only.